Well, that didn’t take long. 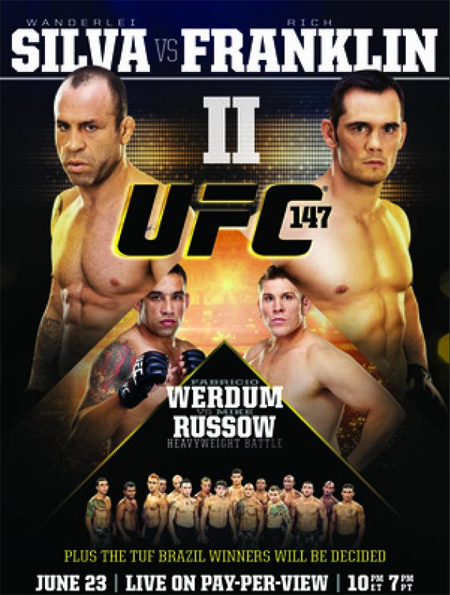 Less than three days after announcing Rich Franklin had agreed to replace Vitor Belfort and headline UFC 147 opposite Wanderlei Silva, the planet’s premier mixed martial arts promotion has already produced the show’s new event poster. “The Phenom” was forced to withdraw from the shootout over the weekend with a broken left hand. Silva and Franklin will battle in a 190-pound catchweight contest. The former middleweight champion hung a close unanimous decision win over Silva in June 2009 at UFC 99. “UFC 147: Silva vs. Franklin II” takes place June 23rd inside Mineirinho Arena in Belo Horizonte, Minas Gerais, Brazil. The pay-per-view broadcast airs live in North America at 10PM ET/7PM PT.